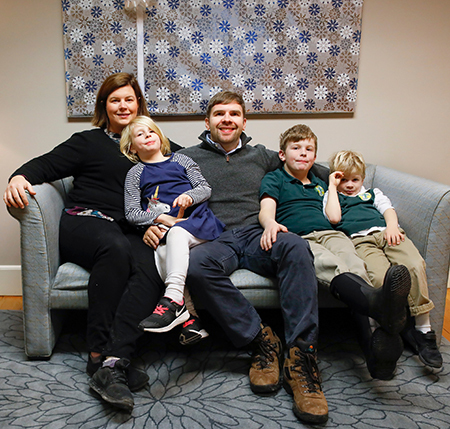 Liz and Jeremy Hitchcock have already started teaching their children – Matthew, 8, Catherine, 6, and Benjamin, 5, about the importance of giving back to the community. • Start a conversation about why giving matters in your family. Ask parents or grandparents if they remember a time when a nonprofit organization was helpful to your family. You might be surprised by what you hear. One friend’s grandmother talked about growing up poor during the Great Depression. A nonprofit brought the family a holiday dinner, with gifts for the children, every year. That family continues to give, every year, to organizations that feed the hungry. • Match your children’s charitable gifts. Encourage children, teens and young adults to share what they can from their allowance money or earnings, and match their gifts at a ratio that works for you. • Buy less, give more. One family I know has each person select a nonprofit doing work that matters deeply to them. Then, instead of buying gifts for each other, they make donations to nonprofits doing critical work. • Give the gift of “The Grandparent Legacy Project.” This book, (available at 2164.net/product/the-grandparent-legacy-project) is designed to help grandparents pass philanthropic values and legacies on to their grandchildren. It includes stories about families and exercises to guide grandparents and grandchildren through the process of telling their own family’s giving story. • Create a charitable fund for a family member. A family we work with recognized that they, and their children, had everything they needed. Rather than giving more gifts, they opened charitable funds for their children when they turned 18. Now extended family members make gifts to those funds at the holidays, adding to the amount the younger generation can direct in grants to nonprofits doing great work in our communities. • If you own a business, match employee gifts to community nonprofits. There are many ways New Hampshire businesses give during the holidays — from giving trees to food drives volunteering — but one powerful way is to match employee contributions to nonprofits. To be blunt, like any business or household, what nonprofits need most is money. Matching contributions increase the impact of your team members’ contributions and drive up participation.